BRISTOL - From tutus to bath salts, a group of nine young adults with autism pitched their ideas for money-making businesses to a panel of judges at Ability Beyond on Friday. Ability Beyond is a nonprofit organization in Bristol serving people with disabilities, through support from Autism Speaks and local business leaders. The event was similar to the reality TV show “Shark Tank,” but with the judges offering supportive advice to help the young entrepreneurs establish and grow their businesses. “This is my favorite day of the year in my job, except for Valentine’s Day,” said Michelle Ouimette, managing director of Roses for Autism, a Guilford-based non-profit that sells roses and provides mentorship and career guidance for young people with autism. She is also the director of Ability Beyond. “This is our third year of doing this pitch panel, and every year it gets better and bigger and more exciting,” she said. 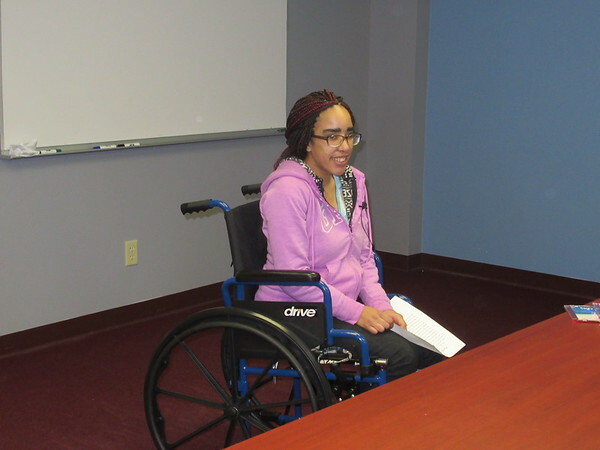 Ability Beyond has an eight-week curriculum every summer to teach aspects of starting a business, she explained. 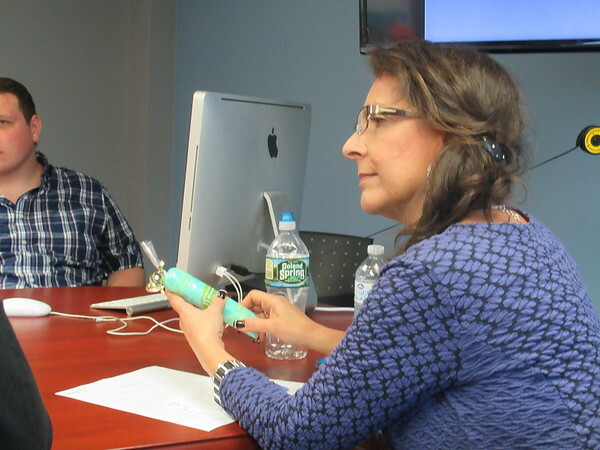 “Entrepreneurship is a real avenue for people with disabilities to create an income. It also gives them a chance to feel some self worth and some purpose, and to pursue their passion just like everyone else likes to. n Vanessa Vioude, who runs Vioude’s Design, a tutu designing and sewing business. She described the challenge she faces having to limit her distractions and be more organized in trying to meet her orders. 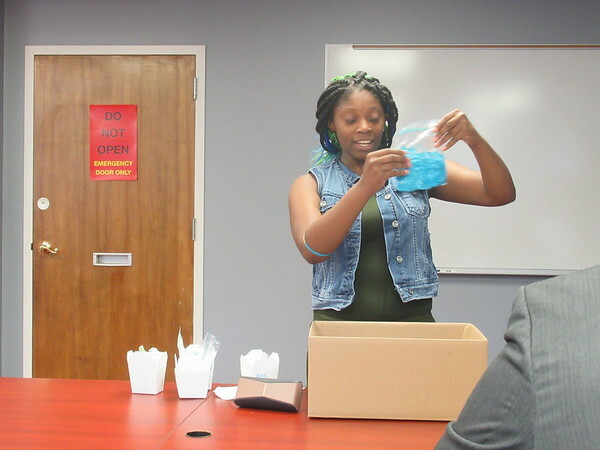 She creates her own slime as a therapeutic tool, inspired by her siblings who also have autism and who find playing with the gooey substance helpful for their stress and anxiety. She has a whole line of slimes with names like Moon Cheese, Lizard Skin, Pumpkin Guts, and Dragon Breath, based on their colors and textures. n Kyra Albrecht records her own meditation CDs, using nature sounds and relaxing music. “It has always been my dream to go to Africa to help the families and children, who do not have enough to eat,” she said. “However, considering the fact that I’m only 22 and I would need a passport and I would have to get on a plane and I do not have the money, it was suggested that I could donate money to them and it could be just as helpful. n Tommy Canning is an aspiring author who writes children’s books that he says teach lessons, under the name Tesseract Books. “I haven’t published anything yet but I’m on the verge. They just need illustrations and it’s a wrap,” he said. n Shantell Moore makes and packages her own line of trail mix. “I would love to be a baker and have my own bakery,” she told the panel. “I am studying being a baker, making baked goods, and keeping myself focused. I am deeply in love with baking and cooking. “The things I make people actually love. They buy, they eat, they enjoy, and that’s what I love about what I do because I make people happy and make people want to have my baked goods,” she explained. n Justin Amos wants to be a professional photographer. He gave a slideshow of his work, focused mainly on shots of nature and food. “I like taking photos of various things, such as animals, breathtaking landscapes, and scrumptious food,” he said, noting that he take his photographs using his phone. n Heather McCarthy creates hair bows, which she described as “handmade with pure love and joy.” The idea grew out of her love of cheerleading, which she has been doing since preschool, and wearing bows in her hair. She is not limited to cheerleading bows, however; she wants to make matching mother and daughter bows, and holiday themed bows. She said she looked up the ingredients she needed online, produced a line of bath salts with different colors and scents, and packaged them attractively. She wants to get the schooling and certification to work with cats and their humans to improve their communication and help people deal with negative cat behaviors, and dispel myths about cats. The panelists were: Caitlin Wheeler, of Caitlin Wheeler Enterprises; Rob Camp Fuoco, executive director of the nonprofit Sharing Nature, who works with children doing garden programs; Anthony Pierlioni, a consultant with Street Smart Ventures who helps young people build their resumes through entrepreneurial activities, and is senior director of The Turtle Room conservation program; and Joanna Rapoza, writer, stand-up comic, voiceover artist, and development officer at KBJB internet radio. For more information go to www.abilitybeyond.org . Posted in The Bristol Press, Bristol, General News on Saturday, 28 October 2017 21:31. Updated: Saturday, 28 October 2017 21:33.